How does the Sun go about producing its energy? What is the process involved? And once the energy is produced, how does it travel to planet Earth and sustain our Pale Blue Dot? The quick answer is that the Sun (and all the other stars in the universe) are able to generate energy as they are basically massive balls of fusion reactions. But that doesn’t really say very much, unless, of course, you are already farmilar with how stars form and how fusion works. So let’s break things down a bit. Scientists explain this process of stellar energy generation by going back to how stars form, which goes back to the Nebula Theory. This theory states that the nuclear reaction inside of a star began when a vast cloud of gas and particles – known as a “nebula” – collapsed under the pressure from its own gravity. It is this collapse that ultimately birthed the big ball of light in the middle of our Solar System, as it triggered a process where atoms began fusing together due to the excess of pressure and heat. Specifically, in core of stars that are about the size of the Sun, energy is produced when hydrogen atoms (H) convert and become helium (He). During this fusion process, some of the matter of the fusing nuclei is not conserved, and it is converted to photons. 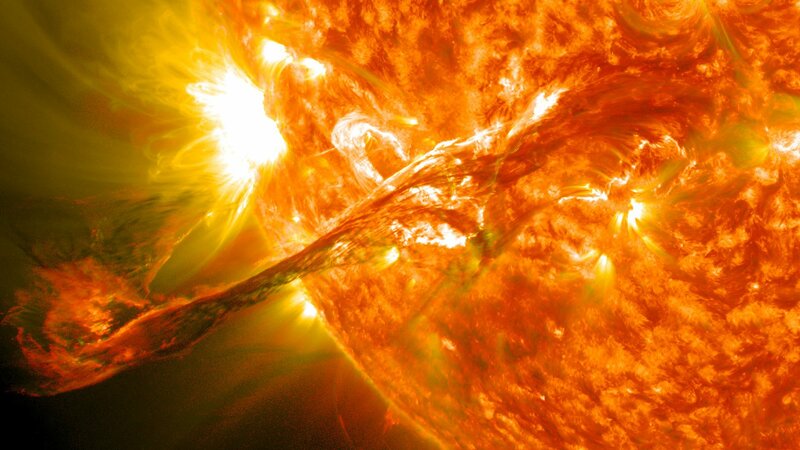 Just how much energy does our Sun produce? Well, in a single second, the sun fuses about 620 million metric tons of hydrogen in its core. This means that, in just one second, the Sun produces enough energy to power New York City for about 100 years. Larger stars have more heat and pressure; as a result, they are able to fuse heavier elements together. Since we are fusing heavier elements, there is more matter that is not conserved and, ergo, there is more heat and pressure. This joining of atoms is known as nuclear fusion. And as was mentioned, it is a process that releases a tremendous amount of energy in the form of heat and light. Notably, the Sun’s layers each play a role in ensuring that solar energy gets distributed far enough to maintain life on our planet. 99% of the energy produced by the Sun takes place within the core. Beyond this layer, fusion will have almost completely stopped. The rest of the Sun is heated by the energy that moves out from the core through the different layers, eventually reaching the outer layer and escaping into space as sunlight or particle energy. The succeeding layers of the Sun are the Radiative Zone, the Convective Zone, and the Photosphere. These layers get progressively cooler the farther away they are from the core. Fusion reactions no longer occur in most of them. They do, however, facilitate the transfer of heat and energy outwards, away from the core and into outer space. When this heat and energy reaches Earth, the ozone layer of the atmosphere filters much of the Sun’s ultra-violet radiation, but lets some pass through. This energy is essential for life on our planet.